by Christian Joerges and Josef Falke (eds). Hart Publishing, Oxford, UK, 2011. 544 pages. Cloth £62.00 / $124.00. ISBN 978-1849461191. Reviewed by Dr Benedict Sheehy, Senior Lecturer Business and Law, RMIT University. This edited volume is an exciting, challenging read. It would suit advanced scholars in a range of different disciplines as well as serve as an excellent text for an advanced group of post-graduate students studying sociology, law, economics and globalisation. The work brings together three themes that are intimately related but seldom drawn together ‒ namely, Polanyi’s thought, globalization and law. 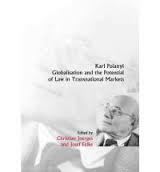 These themes, guided by Polanyi’s theory of a “double movement”, being a disembedding of the economy on the one hand, countered by re-embedding socially protective counter-movements on the other, are explored in the context of transnational markets. Written by a range scholars, including many leaders in a number of areas such as economic sociology, transnational private regulation, transnational corporate governance, constitutional and international law, the book is a veritable goldmine of ideas and thinking across a multidisciplinary landscape that is as innovative as it is interesting. Outstanding scholars such as Martin Herberg, Olaf Dilling, Marc Amstutz, Sol Picciotto and Peer Zumbansen are among the contributors. The wealth of knowledge these scholars contribute has been drawn together and masterfully edited by the team of Christian Joerges and Josef Falke and put into a very readable, consistent, and intellectually challenging work. The chapters, each individually authored, have been very carefully worked through for clarity of expression and consistency of thought and language, and all range between 20-25 pages allowing for a thorough exposition of the particular topic at hand. Although English is not a first language for most of the authors, which is reflected occasionally in longer sentence constructions and a few other similar conventions, the work of the editors is such that in many cases the writing is superior in terms of technical expression and precision to what might expect from scholars whose first language is English. Thus the only challenges in this book come from what the challenge of a good work is: the challenge of engaging in new thinking and with innovative ideas. The work is a product of two long term EU research projects, “Trade Liberalisation and Social Regulation in Transnational Constellations” and “Transnational Governance, Deliberative Supranationalism and Constitutionalism”. The text is divided into four parts with a total of 18 chapters. The first part, “General Theories” is made up of six chapters. The first chapter, “Transnational Law and the Polanyi Problem,” is by Alexander Ebner. Ebner expounds on the institutional changes in the state which limit to some degree, the extent to which the state can protect its society ‒ a result of disembedding. He notes a counter move, however, which also reflects efforts by governments as well [*356] as non-governmental bodies to re-embed the economic system. In the second chapter, Regina Kreide takes a Habermasian approach to the problem noting the potential paradoxical or dialectical outcomes of transnational law. As she sees it, such law may both lack democratic legitimacy while at the same time strengthening democracy. That chapter is followed by Sabine Frerich’s analysis ‒ an analysis described as “economic sociology of law” ‒ titled “Re-embedding Neo-liberal Constitutionalism: A Polanyian Case for the Economic Sociology of Law”. Frerich sees a potential for Economics and Society, Law and Economy as well as Law and Society to reconnect through Polanyi’s embeddedness paradigm. In the fourth chapter, “The Structural Transformation of Embeddedeness”, Poul Kjaer’s examination of functional differentiation leads him to argue that the necessity of a counterbalancing force re-embbeding the economy cannot look to pre-modern times. Rather, they must be found in the contemporary context where he indeed does find them. Part two of the work, dealing with “Norm-generating Mechanisms: Middle-range Theories”, contains only two chapters: one by each of Martin Herberg and Olaf Dilling. Herberg’s chapter, “Bringing Professions back in: A Fresh Look at the Dynamics of Institution-building in (World) Society” examines the role of the professions in taming the excesses of the market particularly through their role in the development of standards such as those for environmental quality or occupational health and safety. In his chapter, “Enclosed Solutions for Common Problems? Uncertainty, Precaution and Collective Learning in Environmental Law” Dilling focuses on Polanyi’s interest in environmentalism and advances the analysis of Polanyi’s views through a review of governance of global commons. The third part of the work is dedicated to “Case Studies on Dis-embedding and Re-embedding of Transnational Markets.” The first chapter of this part, being chapter 7, “Dis-embedding and Regulation: The Paradox of International Finance” is the work of Sol Picciotto. Picciotto notes the irony of de-regulation simultaneously occurring with a significant amount of new formal regulation and the fundamental problem of ending easy credit, which he sees as a critical part of de-financialising the economy and turning capital to productive activities instead. A particularly interesting contribution is Peer Zumbansen’s “The Next ‘Great Transformation’? The Double Movement in Transnational Corporate Governance and Capital Markets Regulation.” Zumbansen identifies and describes a transnational legal pluralism composed of quasi-private issue specific norm generators and quasi-public state-based law making, revealing a new form of embeddedeness. Indeed, in this context he notes the loss of political pole stars “Left” and “Right” and draws from that the need to learn to ask new questions about the same phenomena that are core to social and economic existence. Jean-Christoph Graz uses his chapter, “International Standards and the Service Economy” to consider the role of legalization as a Polanyian protective mechanism while capital pushes to further disembed the economic sphere. Graz’s contribution adds further insight [*357] into the legitimacy problems of transnational law. This chapter is followed by, chapter 10, Markus Krajewski’s study of health care. “Commodifying and Embedding Services of General Interests in Transnational contexts: The Example of Healthcare Liberalisation in the EU and the WTO” Krajewski compares EU with its social regulation with the WTO’s approach with its strong economic mandate, and finds that despite the EU’s potential for more, it does not differ markedly from the WTO. Chapter 11 is Olga Batura’s “Embedded Transnational Markets for Telecommunications Services”, identifying the state’s important role in re-embedding the economy. Batura argues that those seeking liberalisation have had to address the EU’s social regulation. In contrast to Krajewski’s case, Batura finds that this regulation contrasts with the WTO’s disembedded approach. In a critical chapter on Corporate Social Responsibility Josef Falke examines whether CSR could or does indeed function as a re-embedding mechanism. Falke proposes a cautious optimism about CSR as performing that function. In chapter 13Claire Methven O’Brien takes aim at the concept of “embedded liberalism”, characterising it as a specious concept. Methven O’Brien argues cogently that this concept, UN Special Representative on Business and Human Rights John Ruggie, is based on incompatible assumptions and that only constitutionalisation of human rights will answer the concern. The final chapter of Part Three, “Globalising Speenhamland: On the Transnational Metamorphosis of Corporate Social Responsibility”, is by Marc Amstutz. Amstutz use a Luhmanesque framework to argue CSR is an auto-poetic cognitive counter-move to economic laissez-faire markets. Part Four examines the plurality of law that undergirds transnational markets, from public and private law, international and national, soft and hard, courts, to the administrative systems and agencies that facilitate their operations. Chapter 15, “The State in International Law,” is by Karl-Heinz Ladeur focuses on initiatives beyond the state based international system. His analysis emphasises the fragmented nature of transnational law, not following any unified coherent objective or idea, and leading to his view of transnational networks that lack hierarchy. The chapter which follows is Moritz Renner‘s “The Dialectics of Transnational Economic Constitutionalism.” Renner examines the constitutionalisation of the economy as both a dis-embedding and re-embedding process acting on the market, whereby transnational de-regulatory forces impose on national jurisdictions but transnational legal processes are themselves new sites for political contest. In a similar vein in chapter 17, Viellechner studies the example of ICANN, the Internet Corporation for Assigned Names and Numbers. Viellechner argues that ICANN is not a market institution, but a social structure establishing its own legal system. Editor Christian Joerges authored the final chapter in which he seeks to create a unified foundation for a law of conflicts. Titled “A New Type of Conflicts Law as the Legal Paradigm of the Postnational Constellation”, Joerges argues that a “procedural paradigm of the discourse theory of law” would provide an [*358] appropriate foundation addressing at least to some degree the legitimacy deficit endemic to transnational law. There is little to critique in such a dense, interesting, and well-thought out work. As noted, the leisure to work through it with a group of advanced students would be a pleasure. Its chapters are exceptionally well thought out, structured and written, and would readily serve as model papers for students. The few criticisms would be that some chapters deserve a book in their own right. For example, one would hope that both Amstutz and Zambansen would re-work their chapters and develop their themes further. Additionally, some of the references are not available to English speakers. One wishes the title was more attractive to readers with little familiarity with Polanyi as there is much of interest to scholars labouring in the many fields touched upon in this work. The broad thinking, some of which has little to do with Polanyi, merits a wider audience and the title compromises the book’s appeal. Finally, at times the analysis is mechanistic, Hegelian one might have said. To some degree, this analysis may flow from the subject matter ‒ Polanyi himself seems somewhat deterministic about his double movement. This observation leads to a final comment: some further work, perhaps even a chapter dedicated to a critical reading of Polanyi’s thesis in this context would have been most insightful given the calibre of the rest of the work. It is hardly fair, however, to criticise a work for failing to be what the critic desires. Copyright 2013 by the Author, Benedict Sheehy.